Proud parents of first son Lee Joon Hoo born on March 31, 2015. As he does not like to be restrained, they asked him towards the end of the interview: "You are single now; maybe you like to lead a liberated life?" He shook his head and replied with a serious look: "I don't know what I will do, unless I am in love. I can only say, the "real me" and the "one working" in the movie is not the same. If the love of my life appears, I would be more gentle and loving than any other man. I believe I will be a very caring and affectionate husband. Actor Lee Byung-hun and actress Lee Min-jung revealed details of their future plans at the press conference at 3pm on August 10 before their wedding. They will tie the knot at the Grand Hyatt Hotel in Seoul at the same day. “I had to prepare thoroughly because marriage is a major event in my life. But there was not enough time due to the promotion of the film, ‘Red 2′ and preparation for my next movie. I’m really sorry to some people, whom I forgot to send invitations. We will live life the fullest as actors as always after marriage.” Lee Byeong-hun told the reporters. The couple were quizzed on their plan about life as actors. ” I will begin a new life today but my life as a actor will not be changed at all. I will try to grapple with my performance and so will Min-jung.” he added. She also agreed with his opinion. “He never mix business with pleasure. I will ask some advices when I choose my next project. Husband is likely to change a lot of my priorities when I pick out my work while I used to talk to my family, friends and management agency.” She added. At the conclusion of the press conference, they told the reporters that they will live happily ever after appreciating the simple things and going through both big joys and sorrows. Meanwhile, the wedding will be held at 6pm on August 10 at the Grand Hyatt Hotel in Seoul as a private event. Senior actor Shing Young-gyun is to officiate the wedding. And the event will be hosted as two part by actor Lee Bum-soo and comedian Shin Dong-yup each. Top singers, Park Jung Hyun (Lena Park), Kim Bum-soo, Park Sun-joo and Dynamic Duo are to sing a song to celebrate the couple’s wedding. They are planning to honeymoon on August 12 and set up their home at Lee Byeong-hun’s house. 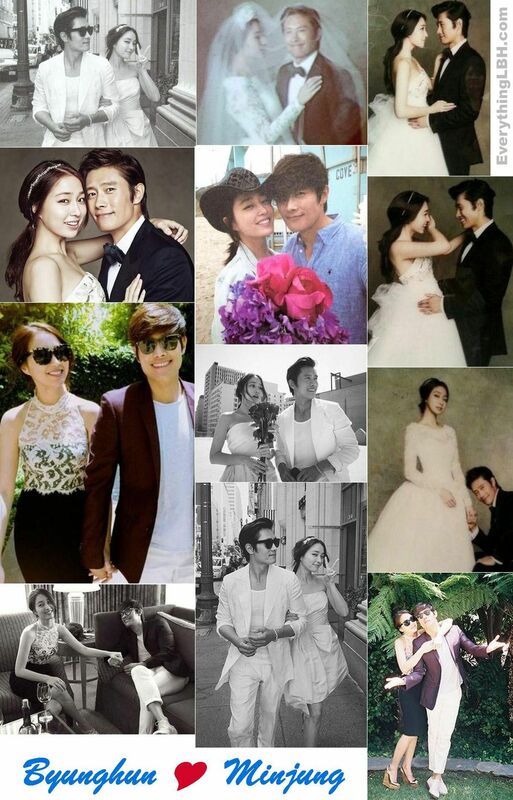 Newlywed top star couple Lee Byung Hun and Lee Min Jung left on August 12 to Maldives for their honeymoon. The lovely celebrity couple will be spending time together without any companion accompanying them unlike some celebrities who would bring (personal) photographers along. This is what they had wished to do together just like planning the August 10 wedding without any sponsorship. Byunghun and Minjung spent about 7 days in Maldives relaxing in the enchanting ocean paradise and enjoying each other's company. Both of them upon return to Korea will start their respective filming and work activities straightaway. Lee Byung Hun will soon start filming his new film "Memories of the Sword" with actress Jeon Do Yeon while Lee Min Jung will continue with endorsement events while deciding on her next drama project. Byunghun-Minjung sporting the couple look at the airport, returning from Maldives on August 19. 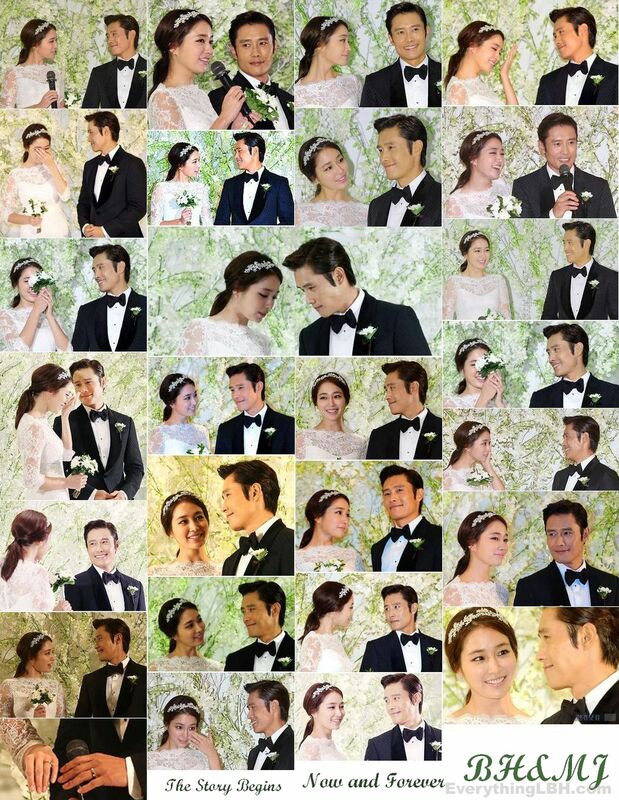 Newlywed celebrity couple Lee Min Jung and Lee Byung Hun will be releasing additional photos from their wedding pictorial. Some wedding pictures were already revealed online before but more of it will be seen on the latest issue of ELLE Magazine. To follow the full stunning pictorial, an inside story about Lee Byung Hun's movie theater proposal and the August 10 wedding itself will also be featured in the magazine as both shared their thoughts and experience of their wonderful union. 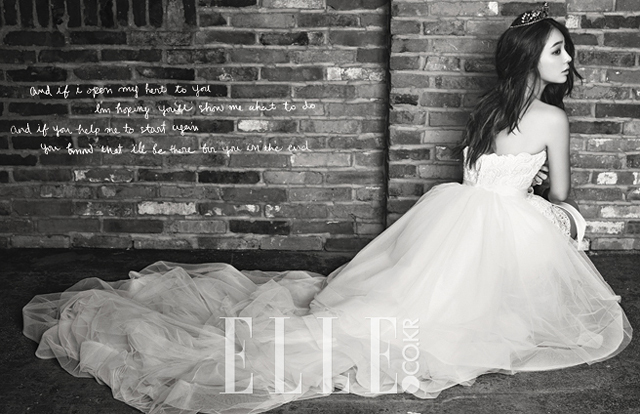 The Lee Min Jung and Lee Byung Hun's special wedding spread will be on the September issue of ELLE Magazine (Korea). Grab your copy! [by Joy Kim] One of the hottest celebrity couple, actress Lee Min jung and Lee Byung hun got married on August 10, and the happy couple’s wedding pictorial was released online. 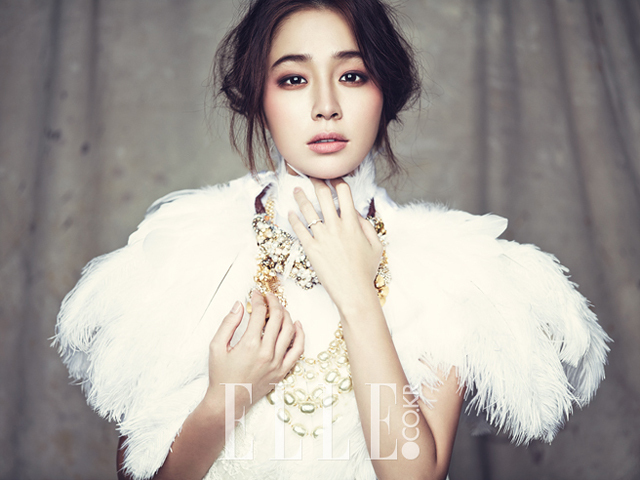 With fashion magazine ELLE, actress Lee Min jung revealed her wedding pictorial and behind stories from her wedding. Previously, Lee’s image of wearing a mini dress was released and it had become an issue on internet. With ELLE, she released additional pictorial. From the additional pictorial, Lee is wearing a beautiful wedding gown and a veil. On top of her she is holding a crown. She looks like a princess in her pictorial. Even though it’s been a few days since Lee Min Jung and Lee Byung Hun got married in a private ceremony, more details have been leaking by the day! It has been reported that Lee Byung Hun romantically serenaded his new wife with the saxophone! A photo has been circulated online of Lee Min Jung in a black mini-dress happily listening to her husband’s saxophone performance dedicated to her. Lee Byung Heon played saxophone for Lee Min Jung at wedding party. On August 14th, a photo of Lee Byung Heon playing saxophone for Lee Min Jung at their wedding party was unveiled by a source. 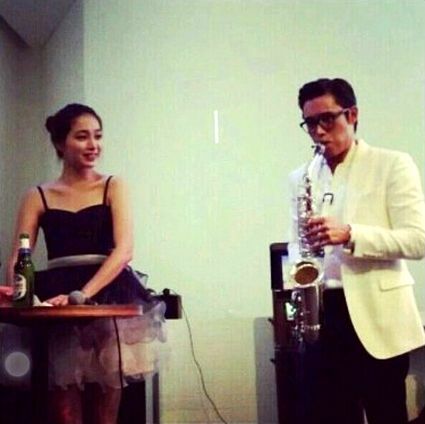 The photo shows Lee Min Jung in a black mini dress, and Lee Byung Heon playing saxophone in front of her. It is said that the wedding party was attended by many close friends of Lee Byung Heon, including director Lee Hyun Seung, actor Song Seung Heon, and saxophonist Danny Jung. Lee Byung Heon and Lee Min Jung's wedding ceremony was held on August 10th at Grand Hyatt Hotel located in Hannam-dong, Seoul, and approximately 900 people attended the wedding. Netizens who saw the photo left comments, such as "They are looking so happy", "Looks like Lee Byung Heon practiced saxophone for Lee Min Jung", and "I'm sure Lee Min Jung was very surprised." Lee Min Jung revealed more about her marriage along with a wedding shoot. After releasing a cut of her in a stunning wedding dress, Elle released more photos from the same spread of the lovely couple. Lee Min Jung talked about her husband in the interview attached to the spread. When asked whether she believes she got not only a husband but also a mentor, she answered, "Lee Byung Hun is a great senior to look up to, so yes I do feel that way." She also talked about how she felt about Lee Byung Hun′s big proposal. "I was a bit annoyed when Lee Byung Hun said in an interview with the August issue of Elle that he didn′t understand why we need a proposal, but I was touched at the one he prepared," she said. Lee Byung Hun played a special video for his proposal after getting their families together. The actress added, "I couldn′t help but show tears because I could really feel how sincere he was." 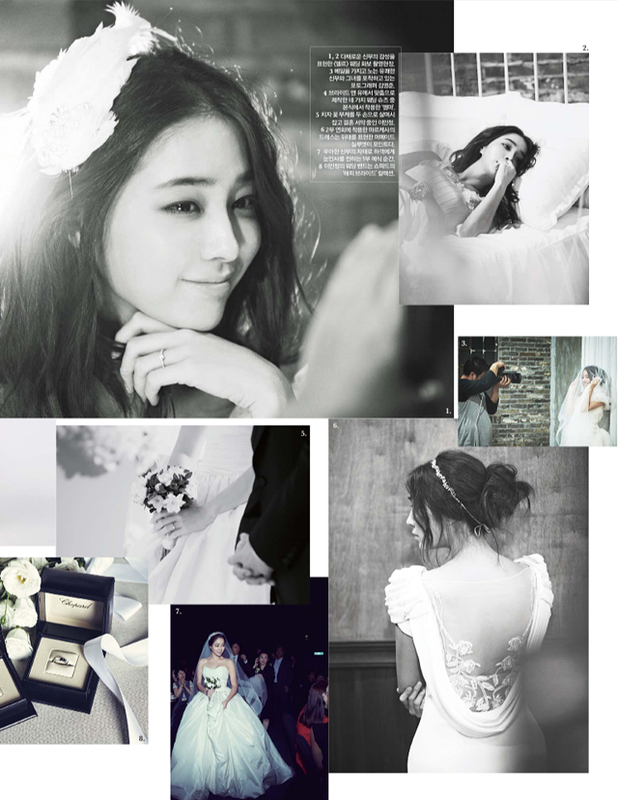 The September issue of Elle also talks about Lee Min Jung′s wedding styles with stylist Ahn Mi Kyung. 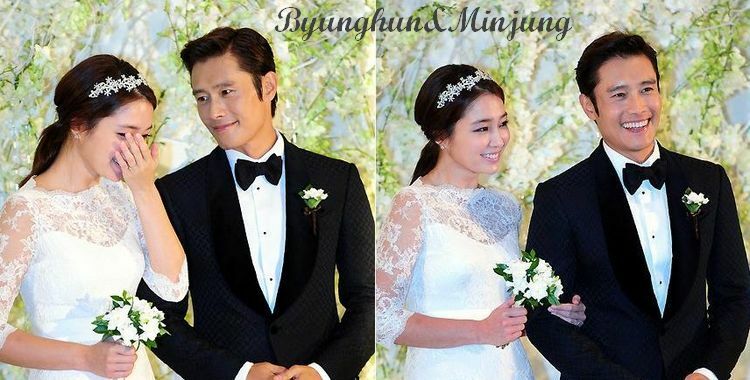 Lee Byung Hun (이병헌) and Lee Min Jung (이민정) tied the knot at The Grand Hyatt in Seoul, South Korea on August 10, 2013. The star-studded wedding ceremony was dubbed by the press as 'The Wedding of the Century'. The beautiful bride met the press in a gorgeous lace gown from Marchesa Bridal Fall/Winter 2013 collection. During the ceremony, she was seen wearing a strapless voluminous gown with a lace bustier from the same collection. 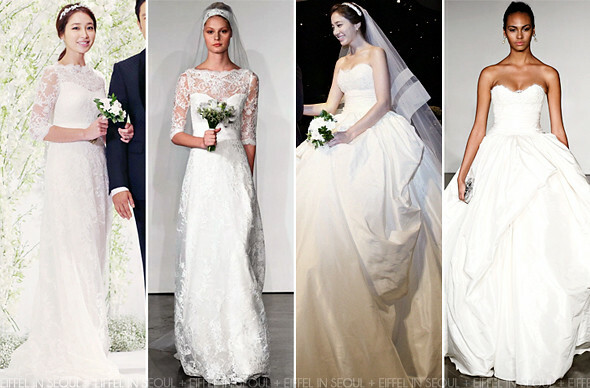 Which is your favorite wedding gown on Lee Min Jung? Thanks so much to @TheRealCZ at Lee Min Jung thread for the wonderful, insightful and most heartwarmingly ELLE interview by Lee Min Jung. A must read, recollection about LBH and how they met. It is an amazingly heartwarming feeling reading the words of someone who knows and understands Lee Byung Hun the way fans and others do not. And yet, by heaven, I think my love as rareAs any she belied with false compare. I know she just got married, but I really can't wait for her next drama.